Countless bands toil in obscurity for years, hoping for one big break. But for some, that break comes a lot more quickly. Case in point: the Flipsyde, a hip-hop quartet that exploded out of Oakland, California, last year thanks to their We the People album and its powerful single, "Someday." Within three months of forming, multiple labels were courting the group. They ultimately signed with Interscope after auditioning in the office of label head Jimmy Iovine with a drum machine and acoustic guitars. That's right: acoustic guitars. Blending beats with nylon- and steel-string guitars has been a Flipsyde signature since Day One, when guitarist Dave Lopez met rapper Piper and vocalist/guitarist Steve Knight at an Oakland rehearsal studio. A guitar solo is just like another verse. It's another way of talking, but without words. "I'd been working there for thirteen years," says Lopez, speaking during a break from Flipsyde's current tour supporting Black Eyed Peas. "I'd been in and out of bands forever. But one day Steve walked in and played me 'Someday,' and we started jamming, and we've been doing it ever since." That was the song that caught Iovine's ear, among others. It was also used as theme music for several European television shows, and NBC chose it to promote the recent Winter Olympics. 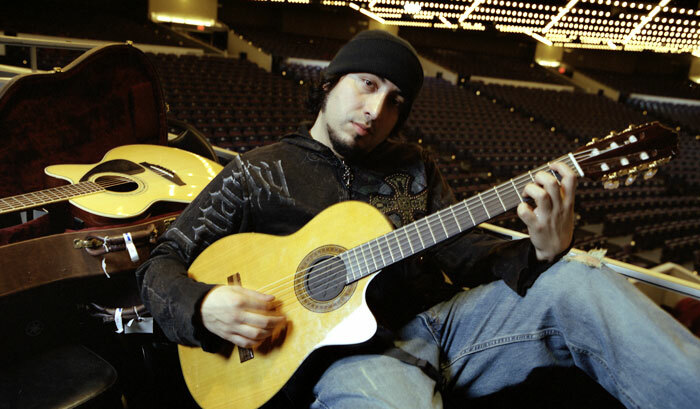 Lopez says it was almost an accident that "Someday" featured a nylon-string solo: "It was just a temporary part, because I couldn't find the right tone on electric. But it ended up sounding so nice that we kept it. And now acoustic guitar is such a big part of Flipsyde. We've learned that heavily distorted guitar parts tend to get lost in the mix, while acoustic guitars sit real nice in there." Another cornerstone of the group's sound is Lopez's Latin tinge. "I've always thought of myself as a rock player," he explains. "I just do lots of Latin licks. I was born in Chile, though I came to the States when I was seven. In Chile, everyone plays guitar. You go to a party, and the guitar gets passed to everyone, even Grandma. It's just part of the culture. My brother, Livio, is a serious classical guitar nut. Anyway, whenever I jam on something, that Latin feel just comes out." Lately Lopez has been picking Yamaha acoustics. "Before I got the Yamahas," he recalls, "I always had problems with feedback, or even just getting the tone I wanted. But then I talked to George Pajon, Jr., from the Black Eyed Peas, who always had great acoustic guitar tones. He told me to check out the Yamahas, so I did." Dave wound up getting a jumbo-bodied LJX6C steel-string--the same model the Black Eyed Peas use--and a CGX171CCA nylon-string. "I couldn't be happier with them," says Dave. "They sound great--though I'm not really surprised. I've had an old '70s Yamaha acoustic forever. It was originally a cheap guitar, but it's aged so nicely that it wound up being my best-sounding guitar. And even my brother Livio gives me the love for the Yamaha nylon-string, and he's hated every other guitar I've ever had!" Lopez just scratches his head when listeners equate the Flipsyde to recent bands that blend hip-hop and rock guitars. "Back in the early days of hip-hop, all the groups I listened to the most, like Run DMC and the Beastie Boys, used lots of guitars. You'd see a Run DMC video, and there would be two guys on the mikes, a turntable, and a guitarist, and that's exactly what we do. So it's funny to me when people compare us to Linkin Park or Limp Bizkit, because the stuff I used to listen to had such a rock/blues edge." He pauses. "But then, I used to break-dance to Van Halen, so I guess I was flipping it even back then." While touring, the Flipsyde are writing their next album on their tour bus. "I think the album will be a little more raw-sounding," says Lopez, "and it's definitely going to have more guitar. We're writing about the things in our lives right now, the things we've seen in the last year. We've been around the world, and have seen so many things that moved us. In the end, our music is really all about the words. But to me, a guitar solo is just like another verse. It's another way of talking, but without words. When we played in India last year, lots of people in the audience didn't know the words to the songs or understand everything we were saying. But when I played the solo to 'Someday,' everyone sang along with it!"